Pool designers painstakingly consider many details when creating a client’s dream backyard — materials, colors and lifestyle just to name a few. But how much thought is given to a poolscape’s sound? The acoustics of a project are every bit as important as the visuals, and overlooking (overlistening?) this crucial detail can result in a project that’s easy on the eyes but hard on the ears. Here, builders discuss ways to mask unwanted noise and create pleasing soundscapes. Traffic, barking dogs and noisy neighbors are not what you want to hear when relaxing in a chaise longue on a tanning shelf on a Sunday afternoon. Fortunately, these distractions can be muted through a thoughtful selection and placement of waterfeatures. If the objective is to drown out unwelcome noise, there is a simple rule to follow: The more turbulence, the more sound. Therefore, consider rock waterfalls, rain curtains and multi-tiered streams and fountains — features where water falls on hard surfaces or from tall heights. Laminar sheet falls and arcs won’t add much white noise on their own. That’s because these are designed to spill gracefully into a catch basin or pool — a swan dive instead of a cannonball, if you will. But a combination of these features can produce a symphony of splashing and gurgling, creating an effective sound barrier. And every symphony requires a conductor. To orchestrate a soothing soundscape and block audible nuisances, begin by walking your homeowners through available options. Mark Hegedus, owner of Coastal Coating and Resurfacing in Jacksonville, Fla., shows his customers videos of the types of features he can install. He prefers video to photos because it allows clients to consider not only how the waterfeatures will look, but how they’ll sound. That’s one advantage of using engineered rock over natural stone. Homeowners will know precisely what they’re going to get. “When we used to do real stone, it was pieced in. You couldn’t really give them a picture,” or a sense of how the finished product would sound, Hegedus says. Builders also can use advanced 3-D design software to plan a project’s audible backdrop. Some design software allows the user to experiment with waterfalls, jets, bubblers and other features in a virtual environment to screen out annoying sounds that might bug the homeowner in real life. Some software can even help determine optimal speaker placement and where to stash noisy pool equipment and central-air fans. Knowing precisely where to put waterfeatures, how many and how big before construction eliminates the guesswork. Nearby traffic can make a backyard retreat feel like a drive-time commute, and it’s one of the most common sounds builders have to combat. Peek was tasked with shielding an outdoor entertaining area from the din of a busy neighborhood entrance. He achieved this with a combination of plantings and white noise. To muffle the road, Peek installed a 10-foot tall, 16-foot curved radius rain curtain. Water fell on a bed of 6- to 8-inch river rocks to create more splashing. Also, the curtain was incorporated into a freestanding pavilion. Its roof not only hid the plumbing, it amplified and directed the sound. “Any noise that was traveling up and over, we were trying to totally get rid of that,” says Peek, star of Pool Kings on the DIY Network. The rain curtain, along with a vanishing-edge pool and sheet waterfeatures insulated the yard. “It got rid of 99% of the noise,” Peek says. Dan Lenz describes a similar project that involved a variety of accessories to block the intrusive bangs and rumbles of vehicles. The vice president of All Seasons Pools and Spas, serving Greater Chicago, recalls a backyard that abutted the neighbor’s driveway. Says Lenz: “You could get out of your car and fall into your neighbor’s pool, it so was close.” Engines turning, doors slamming — it was driving the homeowners nuts. The trick was engineering a wall of water sounds between the pool area and the driveway on the other side of the fence. The sound of an elevated spillover spa was amplified with the addition of frothing vertical jets in the elongated spillway. This was crucial, since the spillover spa alone wasn’t much of a noisemaker. Several foam jets on the tanning ledge, plus a series of laminars and deck jets near the fence line contributed to the sound barrier. Also helping blunt neighbor noise was a series of arborvitae trees along the fence. The project was completed in the nick of time. Shortly after, those pesky neighbors installed a basketball hoop. But sometimes noise comes from unexpected places. You wouldn’t think the owner of a home on a golf course would have much to complain about, but the swear words flying off the green had become grating. To protect his grandchild from the profanity, the backyard pool was off limits. The child could only splash in a kiddie pool on the front porch away from foulmouthed golfers. Lenz effectively censored the language with a fountain in the corner, a water slide, deck jets and several outdoor speakers disguised as rocks along the fence line. All this allowed the little one to splash in a G-rated environment. While running water can be an effective buffer, too much can be an assault on the ears. Overdesigning a feature is a real danger. The acoustics of grottos warrant serious consideration. Water spilling off the top of a hard hollow structure can create a sound canon. Be careful where you point it. The homeowner probably doesn’t want the reverberation directed toward the outdoor dining area. Several waterfeatures had to be valved off to reduce the flow. Certainly, high concrete border walls can create a literal echo chamber in the backyard. Vegetation can help overcome this. Builders say ivy and evergreens along the border help diminish the noise reflection. Hegedus, the Jacksonville builder, devised a clever solution of his own: He makes planters out of the same engineered rock he uses to create waterfalls. Not only does the greenery soften hard surfaces, but the palms and other plants look like they’re naturally growing out of the artificial rock waterfall. The contrast is also true: In some cases, a homeowner will want more sound. Some features are easy to manipulate to achieve this. Take a stream with a sheet waterfall spilling into a pool. You can change out the flat flagstone with river rock to create more turbulence, Peek advises. Even easier, tie waterfeatures into an automated system. The advent of internet-connected variable-speed pumps allows homeowners to adjust the volume, so to speak, with an app. This is one reason why builders recommend operating some features with their dedicated booster pumps. That way, consumers can ramp up or throttle back the flow on whichever water accessory they want more or less of. Yes, this is basically paradise in your own backyard. A swim-up bar, or two, is a simple, yet extravagant addition that can facilitate any social event or just a day out in the pool. Customize it with a different shape, diameter, height, or tiles to make it your own. Enjoy your favorite drink while keeping cool in the water, and shaded from the sun. Your neighbors might think you’re throwing a cool party, but really you’ll be relaxing to the soft transition of the LED light s in your spa. Fit for any occasion, person, or day, installing LED lights in your pool will make your backyard experience just that much better. The majestic influence a waterfall can have in your backyard alone is impressive. But adding one to your pool is incredibly beautiful and serene. There are also many styles to choose from, giving you complete control of what your signature pool will look like and how what it will add to your yard. Waterfalls are easily the number one addition to pools that instantly create a sensual backyard. Even without a pool, a backyard appears far better looking with just a small amount of landscaping. Whether you add flowers, trees, or tall leafy plants, your pool is going to look, and feel, as if you were out on vacation. Landscaping also allows you to use your pool as a backdrop for great pictures and an attraction for events. Don’t worry! When you design a custom pool, it’s easy to accommodate the size of your backyard. Designing a pool to perfectly fit your needs would be our pleasure. Here are a few things to consider when planning for the pool that’s perfect for your size yard. The style of your pool will make a huge difference in how your yard as a whole will look. If you prefer your whole yard be taken up by your pool, styles like the Shimmering Canyon, Rustic Haven, and Woodland Springs might be a great option! This leaves room for the extra waterfalls and other cool additions. The shape of your pool will help you decide what style you want and will make it easier to plan other changes in your backyard. From square, rectangle, oval, or even circle, the shape will set up the scenery, but keep in mind you have to have the room! You may be looking at a cheaper option! Woo-hoo! Since a smaller pool doesn't require as much material, or water, as a standard sized pool, the cost of installing won’t be as bad, though, and it might even cut down the time it takes to get it installed. Concrete, vinyl, or fiberglass? Considering you’re looking for a smaller sized pool, a concrete or vinyl pool may be a better option. Since fiberglass is typically used to make larger sized pools, the manufacturer may not offer the smaller size. Both vinyl and concrete are flexible, making it easy to choose a pool style you love without sacrificing your ideal material choice. There are three different types of filters typically used for pools of all sizes: sand, cartridge, and diatomaceous earth (DE). A sand filter is the most common filter in which it filters debris through backwashing the pool water into a waste line. A cartridge filter screens out the dirt and you can simply wash off the film. The DE filter is a proud powder with tiny openings that allow the materials to be absorbed and trapped. 1. Both cardio and strength training are accounted for in the pool. Yes, this means you can shamelessly eat your favorite summer sweets and burn them off while swimming. How exciting! The reason for this is that water is 800 times denser than air, putting your muscles under constant resistance. 2. Swimming workouts are a must. You can swim at different intensities for each workout you do in the pool and your body won't feel the wear and tear it usually would on dry land. Also, if working out in the glistening blue isn't your forte, spending your "rest day" swimming is a great way to relax your muscles without feeling completely out of service. 3. Though we aren't fish, our breathing can improve by swimming. When you're under water, your oxygen intake is at an all-time high, meaning your body adapts to use oxygen more efficiently. This improves your tidal volume and helps lower resting heart rates, better running performance, and low blood pressure. 4. One of the best benefits of working out in your pool is that anyone can do it! From expectant moms to the injured athlete, anyone and everyone is able to get in a workout while enjoying the pool. You don't necessarily have to swim either, there are many exercises that don't require emerging your entire body. 5. Surprise! Swimming releases huge amounts of stress. Between work and play, taking a dip can relieve all of your worries. Simple strokes around the pool are a sure way to give you back your peace of mind while also catching a few rays. Chlorine versus salt, which is better? In one corner, we have the fan favorite, chlorine. In the second, we welcome the new contender, saltwater. Who will we declare the winner? That, you’ll be deciding for yourself in our blog today. The battle of salt versus chlorine pools has created quite a stir. While there are clear advantages to both, we’ll be taking a more in-depth look at the cost, maintenance, and health concerns associated with each. Based on this information, we hope that you’ll walk away with a choice based on your particular wants and needs. Shall we get down to business? Chlorine pools are the most common types of pools found today. Filtration is easy to operate and pool owners tend to favor this system because chlorine tablets are accessible in a variety of retail stores. In this process, pool owners add these tablets to either a pump until or in a disbursement device that dilutes in the water as time passes. One of chlorine’s advantages is that clears water much quicker than saltwater if bacteria or pH levels are off. It can be a matter of 1-2 days versus saltwater’s 3-5 days. Saltwater pools, on the other hand, use dissolved salt rather than chlorine tablets. The chlorinator unit uses electrolysis to break down the salt, transferring it to the pool. Pool owners need to maintain the pH and salt-to-water levels on a regular basis. Maintenance routines are dependent on the rainfall your area receives. This will determine that volume salt added weekly as well as the amount of backwashing. Building or converting to a saltwater system initially costs more but pays for itself within the first 2-3 years. What's YOUR verdict? If you are still a little unsure about which system is right for your household, give us a call at (405) 640-7007. We’re more than happy to help! One of the best parts of spring is the fact that the weather has finally warmed up enough that you can sit out by the pool without your fingers freezing off. However, if you’re feeling like your pool area is looking a little drab, we have some ideas to spice up your patio, turning it into a piece of eye-candy. Fire is something that fascinates us. Whether it’s at a hibachi grill, or simply a summer bonfire. Looking into a fire is truly mesmerizing. Fire pits are a great, easy way to amp up your backyard, turning it into an entertaining venue for guests. The great thing about fire pits is that you can go simple, lavish, or somewhere in the middle. Fire pit design is incredibly versatile, which means that we’ll be able to work with you in finding one that suits your taste and the style of your backyard. If adding fire elements to your pool area sounds like a good idea, but you’re not big on fire pits, it's no big deal. Bobe Water and Fire Features has another fantastic option called Fire Pots. These pots look like they might hold a nice bonsai tree or a Boston fern, but don’t be mistaken. They are actually home to pyrotechnics, not plants. We suggest placing these showpieces at the corners of your pool to really bring it to life. However, they're sure to be eye-catching no matter their location. Installing fire elements around your pool in the form of fire pits or Fire Pots are both great both ways to amplify your backyard, creating an air of sophistication and fun. Your guests will be blown away by your amazing style and attention to design. And don’t worry, we don’t tell them that we’re the ones who gave you the idea. When it’s summer, you can be outside in the sun, tanning while the kids play in the pool and splash water on you to keep you cool. During an Oklahoma winter, we don’t have that same luxury. So what do we do? Well, we make do with what we’ve got, which are incredible ideas and impeccable designs so you can enjoy your backyard space year round even if the pool is closed. So, how exactly are you supposed to enjoy your backyard space year round? Winter isn’t exactly the warmest season in Oklahoma (in fact it’s the coldest). Perhaps the simplest solution to that question is to get a fire pit! Fire pits are not only aesthetically pleasing to the eye, but they also serve the all important function of keeping you warm as you’re outside stargazing, roasting marshmallows or just catching up with a friend. The best thing about fire pits is you can make them as simple or complex as you desire. However, if you really want your fire pit to match with the space you’re trying to create, you should have your fire pit built professionally, especially if your pool builder can also build incredibly looking fire features (Hint: We do). Take a look at our fire features for previous clients done below, and you’ll be convinced that fire pits are one of the best ways to go if you don’t like being trapped indoors all winter long. Just when you thought your outdoor escape couldn’t get any better. Luxury upgrades provide a completely different experience for you and your guests. Adding more than aesthetic value, some can also make maintenance less time consuming while others can reduce the cost of chemicals! And let’s face it, some of these upgrades just look super cool. So be prepared for next season by planning now. Better to begin renovations now instead of cutting in on your sun time during the spring! Who needs a watermark when you can have a fantastic slide in your own backyard! This feature provides endless fun for children and adults alike. Anymore, modern slides come in a variety of shapes in sizes. It’s never been a better time to install one! They’ve changed a bit since the first appearance of springboards. Today, there’s a variety of beautiful and unique board shapes to fit any pool taste! Plus, concepts like two-for-one combination boards and jump platforms are sure to impress any olympian that visits your pool. If you’re looking for a truly interactive backyard, a splash pad is a must-have! 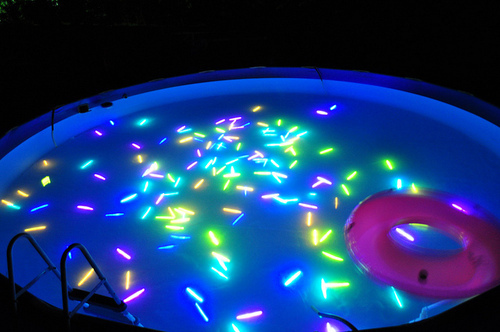 Add a fun twist to your next pool party, all you’ll need is a patch of space and you’ll well on your way! We must say though, be prepared to be the envy of the neighborhood families! If you’re looking to incorporate more relaxing details into your poolscape, we highly recommend a waterfall. It helps to achieve that luxury atmosphere without such high cost. A pro tip: when incorporated with a grotto, it makes for a fantastic tropical retreat! The most popular design innovation, vanishing edges create the look of water stretching out to the landscaping. It’s quite an optical illusion indeed! The real secret is the water flowing over a lowered edge, dropping into a catch basin filtering back into the pool. If you’re a fan of entertaining, a swim up bar is a fantastic investment. Instead of getting stuck between party-hosting and swimming with your guests, you’ll get to enjoy both! Be sure to follow us on Houzz for more project and design ideas! If you’re looking to get a new pool, or update an existing one, it could be tough to figure out your wants, needs and dislikes. The possibilities for pool design are virtually endless, so here’s a few design tips that could give your pool that signature touch. Recessed Lounge Area- We’ve all heard of swim up bars. But have you ever thought about one of these? Unique and beautiful, a recessed lounge area could be the solution you’re looking for to give your pool that extra wow factor. Cascading Waterfall- Adding a waterfall to your pool, big or small, adds a beautiful touch to the life of your pool. Additionally, the flow of water that results from a waterfall helps to deter the growth of algae that occurs when water is stagnant. Beauty and function never looked so good. Zero Edge Pool- You’ve seen them on television. Why not have one in your backyard? Zero edge pools look incredibly beautiful due to their illusionary effect of water being edge to edge. Swim up bar- A swim up bar is a great way to relax and unwind in your pool. It creates a welcoming atmosphere that’s perfect for entertaining your guests. Check out this article for more design tips to make your pool a truly one of a kind creation. The Fourth of July is finally here and we are excited to celebrate! 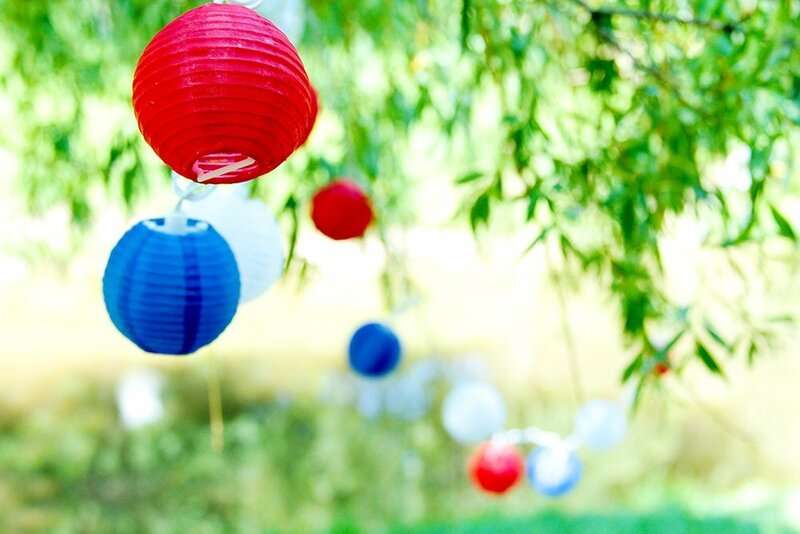 Here are some great ideas to make sure your party is decked out in red, white, and blue. Hang these over your patio, around your pool, and in your trees because nothing is more celebratory than Chinese lanterns. String Christmas lights around the area as well to create a beautifully, festive environment. Fruit kabobs are a perfect treat for the summer. 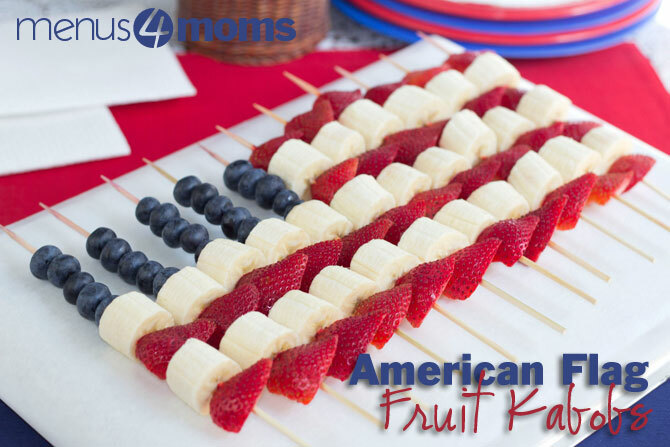 Create an American Flag kabob out of fruit and you’re guaranteed success. Use this recipe to create an easy and fun treat for everyone to enjoy! Burgers are always a good idea. Put a twist on the classic burger by using a sweet and savory burger recipe which includes grilled pineapple, chili sauce, and sweet onions. Top them with American Flag pennants and you’re all set! 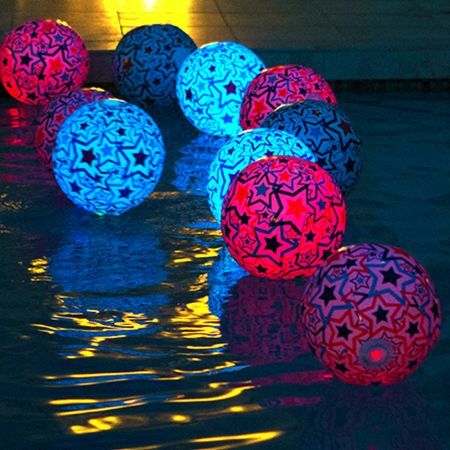 Brighten up any party with these light-up beach balls. Not only do these beach balls make great decorations, but they’re sure to create a good time for everyone attending. This drink is tart and sweet, perfect for any celebration. Use this recipe to make a drink that will please everyone’s taste buds. Wrap your candle holders and flower vases in patriotic paper to create easy and festive table centerpieces. We hope your celebration is a huge success! Happy Fourth! Pool toys and accessories are one of the most entertaining parts of summer. The kids love them, but if we’re being honest, they are just as fun for us adults. Check out our five favorite pool accessories for the summertime! 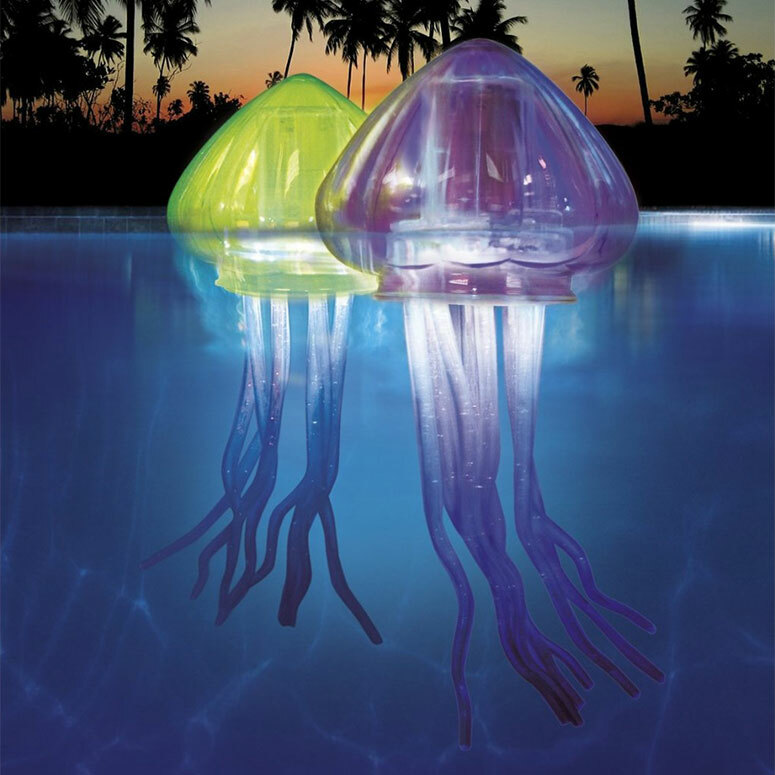 These unique, floating lights will brighten up your pool in an array of different colors. It’s about time they created one of these! 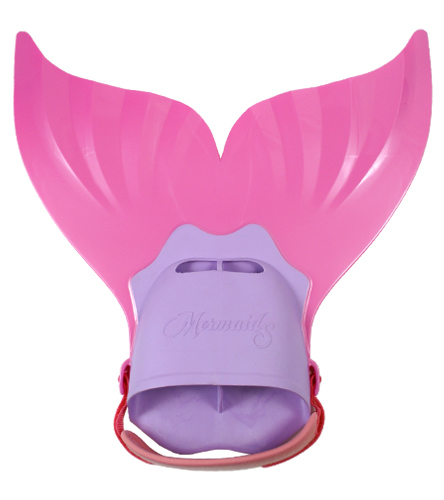 Almost every little girl dreams of being a mermaid and now you can make that dream a reality for the little girl in your life. Now you don’t have to stop playing your game of Poker or Go Fish when you want to get in the pool. This floating card table comes with waterproof playing cards, inflatable seats, and drink holders. You’re all set! This game is incredibly fun for people of all ages. Battling your opponent to see who gets knocked off first will keep you entertained for hours. There is no better way to relax in a pool, than by floating on a huge, cushioned beanbag. This float has features you can’t find anywhere else. We hope you make the most of your summer with these must-have pool accessories! Summertime, AKA pool season, is all about being outside and spending time with the people you care about. With the season in full swing, we wanted to give you five of our favorite ideas to make your backyard warm and inviting for all! The warm glow that Christmas lights bring shouldn’t be stored away for the winter. Hang Christmas lights or clear globe lights on your patio, around your pool, and in your trees. You’ll be amazed how a small amount of lighting will make you fall in love with your backyard. Color is everything. Bring your backyard to life with pops of colorful flowers that everyone will appreciate. Our favorites are Tuberous Begonias and Dahlias. Rope Hammock Swing-Our favorite piece of outdoor furniture right now is the rope hammock swing. Hang it in a tree or purchase a stand to place it near the pool, either way you will be perfectly cozy. There is nothing more relaxing than sitting around a fire pit with the people you care about. Plus, after a good late night swim, s’mores are a must. Need something to liven up the evening? All you need are a couple dozen glow sticks and you are good to go. Toss them in the pool and enjoy a nighttime swim. The kids will love this! With these fun backyard ideas, you'll never want to stay indoors. We hope you enjoy this summertime pool season! 1. Having comfortable seating is a must at any party. We love this Double Sunasan™ Bed. With plenty of room to lounge and an adjustable sun cover, you can be sure your guests will have the perfect place to relax! 2. A refreshing summer cocktail is a great way to quench your guests thirst. Try this Shifting Sands cocktail! 3. Take your pool party from day to night with this gorgeous Real Flame Baltic Square Propane Table. 4. Extra towels are always an important staple when pools are involved. This retro Esquire Magazine Beach Towel will have your guests drying off in style! 5. With all that swimming going on your guests are bound to work up an appetite. Having fresh fruit on hand is a great way to keep their hunger satisfied. 6. No party is complete with out a little music! This Bose® - SoundLink® Mini Bluetooth Speaker is a great portable way to bring your tunes to the outdoors! 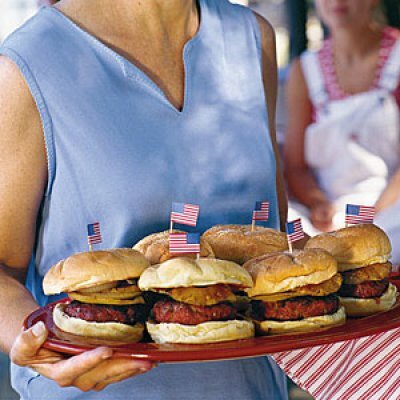 We hope these helped you get some new ideas for your next get together by the pool! Have an excellent pool season! Welcome to our new website. Thank you for stopping by.